This rustic cabin with cinched logs it everything desired in the mountains with all of luxuries of home. The floor-plan has an open living area so that everyone can spread out with plenty of recliners and couches to watch the Big Game. The lower level also a TV room for those who want a quieter space. The Cabin is framed with large windows bringing the outdoor inside. The views are elevated looking straight down the canyon to Ogden Valley. This is what you gain for driving 5-miles up an inclined road. Large expansive deck with an outdoor grill to sun on warm days. 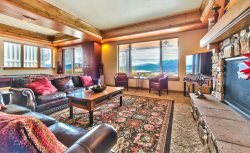 This property has a private hot tub to star gaze and watch night skiing after a long day on the slopes.